This may seem like a stupid topic for a HowTo, but it's a tidbit of information I found useful after getting my Mazdaspeed3. Putting gas in my Sunfire was never an issue. 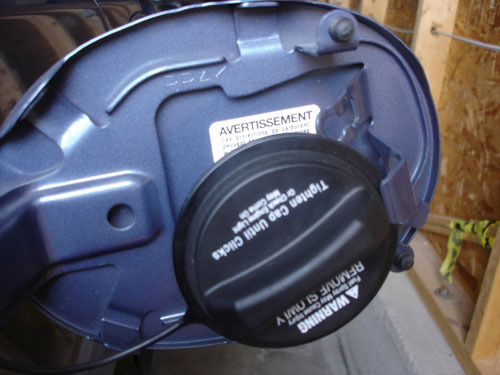 There is a hook on the inside of the little door covering the gas cap where you hang the cap from the attached strap while filling up the car. The Mazda3 has no such hook and, really, no obvious way to store the cap when you remove it. It would seem that they expect you to just let it dangle from the strap against the paint of the car. This seems like a sure fire way to get a bunch of little scratches on the quarter panel. I put the question up to the Toronto Mazda3 club folks and sure enough, they had the answer. Here you can see how the cap will stick to the door without dangling around. It seems to work best with the solid straps they're using now, though I believe it can still be done with the spring-like straps that were on the older cars. It's not entirely fool-proof, but has worked well for me so far. Shame on Mazda for not giving us something as simple as a little hook to hang it from!